At some point, we're going to run out of money. This is the inevitable conclusion I've arrived at after staring at our bank account which seems to shrink, never grow. With that in mind, we've been keeping an eye out for where to live once our poverty forces us to become employed once again. San Diego is now on the list. It's 75 degrees here all the time. 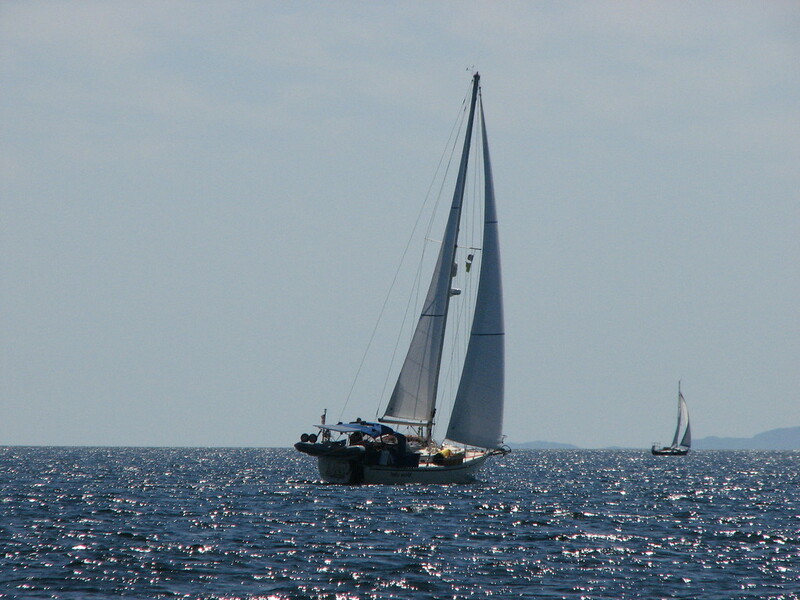 Every afternoon the wind picks up to about 8 knots out of the west. It's sunny, warm, and covered in palm trees. I haven't worn anything other than shorts, t-shirts and flip flops since we got here. We've been here just shy of a week and are really enjoying it. The people have been really friendly. The attitude towards live-aboard boaters seems to be at least incrementally more inviting than the open hostility we've come across in previous places. Perhaps it's the $500/month liveaboard fees the marinas extract from the local liveaboards. On Monday, we are taking off as part of the Baja Ha Ha cruisers' rally to Mexico. 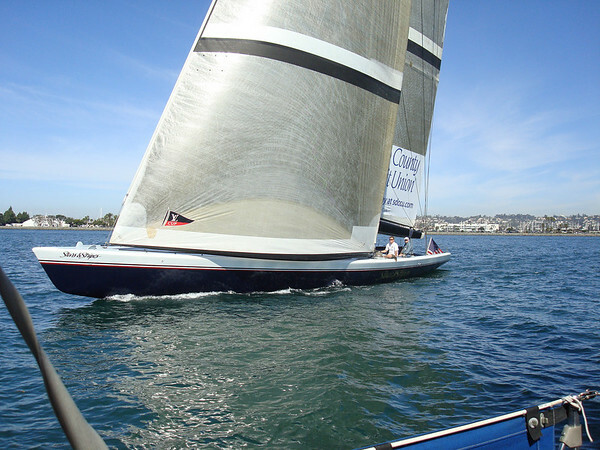 Kim has decided to temporarily jump ship from s/v White Cloud over to s/v Hello World and crew with us down the baja coast. Now it's a party, baby! Christy is off doing shopping at the moment while I sit in the library using the wifi. Since she has the camera, I can't really offload pictures to show how cool it is here so you'll have to take my word for it. More blog posts to come when I can upload some photos. 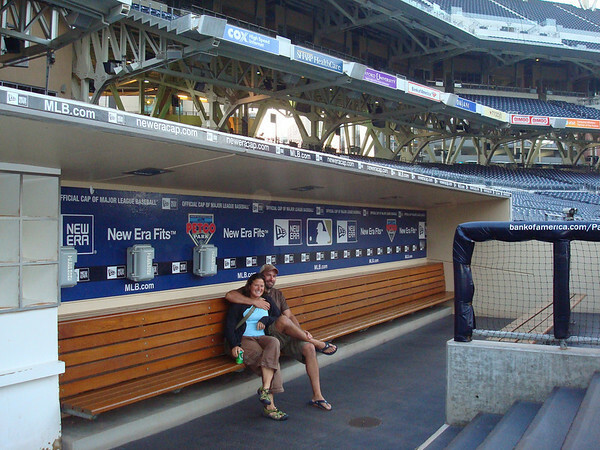 I've got some great shots of us sitting in the dugout at Petco Field, home of the San Diego Padres. Ray, a blog reader from San Diego who works for the Padres extended to us an incredibly gracious offer to tour the park and even took us out for beers. How cool is that?? Thanks Ray! 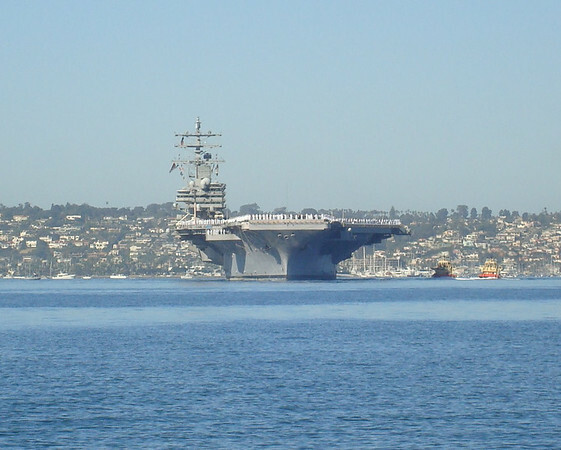 Staring down the business end of an aircraft carrier as it comes into San Diego harbor. The (THE) Stars and Stripes boat from the America's Cup race. Pretty disappointed that they blew by us as fast as they did. I think they cheated. 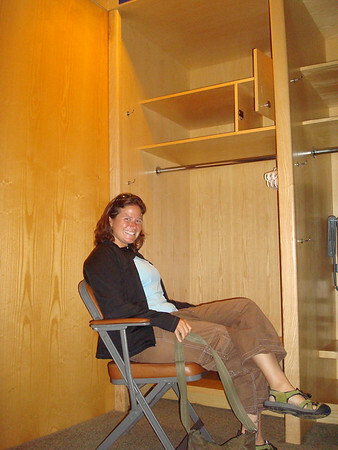 Christy sitting at a locker in the visitor's locker room at Petco Park. 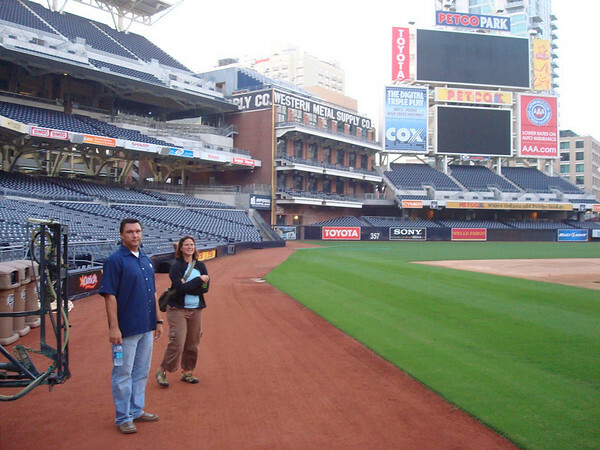 Ray showing us the field at Petco Park. Sitting in the visitor's dugout. Some pretty famous baseball butts have been parked in this exact spot. 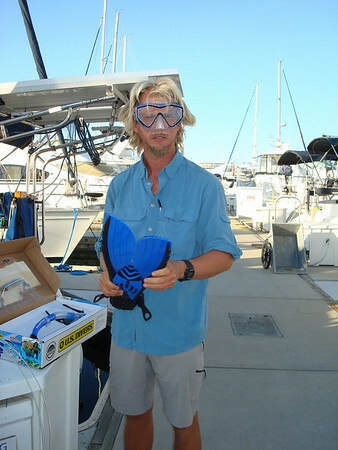 Fisher in a dashing new snorkel outfit. Hey Jason-I lived in SD for 6+ years and just recently moved away. (Spain) If you want more information on the area or need some help convincing you to move there, let me know. I'd love to assist in any way that I can. It's an expensive place to live, but I loved every single minute I lived there! Best wishes on the rest of your trip!